Airport Bus Stop in Venice Coming from the airport, the bus stops at Piazzale Roma, at the north of Venice, then you can walk to your hotel, if not too far, or take a Water bus or a Water taxi. In our opinion, they are the best-bus service from Venice Marco Polo or Trévise (Treviso) Airport to Venice. Fares are at the same price, 8€ than the public buses company ACTV. These buses are clean, they have a special luggage compartment, they don't stop between the airport and Venice (meaning earning 10 to 15 minutes in comparison with the public buses), they have air-conditioning and free Internet Wi-Fi on board. Bus ACTV ATVO airport Marco Polo The journey is direct to Venice: 15 to 20 minutes depending on road traffic. Sing fare Ticket is 8 €, luggage included. You can buy your ticket at the selling machine at the bus station ATVO, at the exit of the airport hall. (15 € for a return ticket, the return ticket has unlimited validity time). At Marco Polo airport, you have vending machines near the bus station. 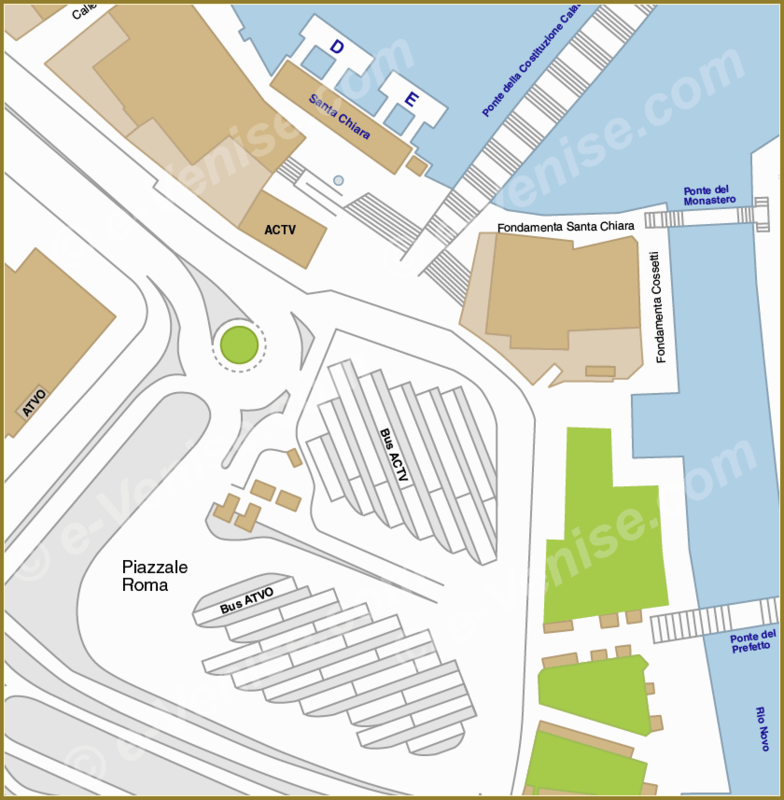 At Piazzale Roma, you must buy your ticket at the ATVO ticket office, at the foot of the big garage building. The ticket office is on the left of the Police Carabinieri office. In our opinion, it's much better to buy your bus ticket online in advance. ATVO buses also have a road link between Venice and Treviso Airport. Fare price is 12€ and the journey lasts about 60 minutes to Venice. These are the public buses, meaning that services are not a the same level than the ATVO ones above, the journey also lasts 25 to 35 minutes while it will take only 15 to 20 with ATVO. 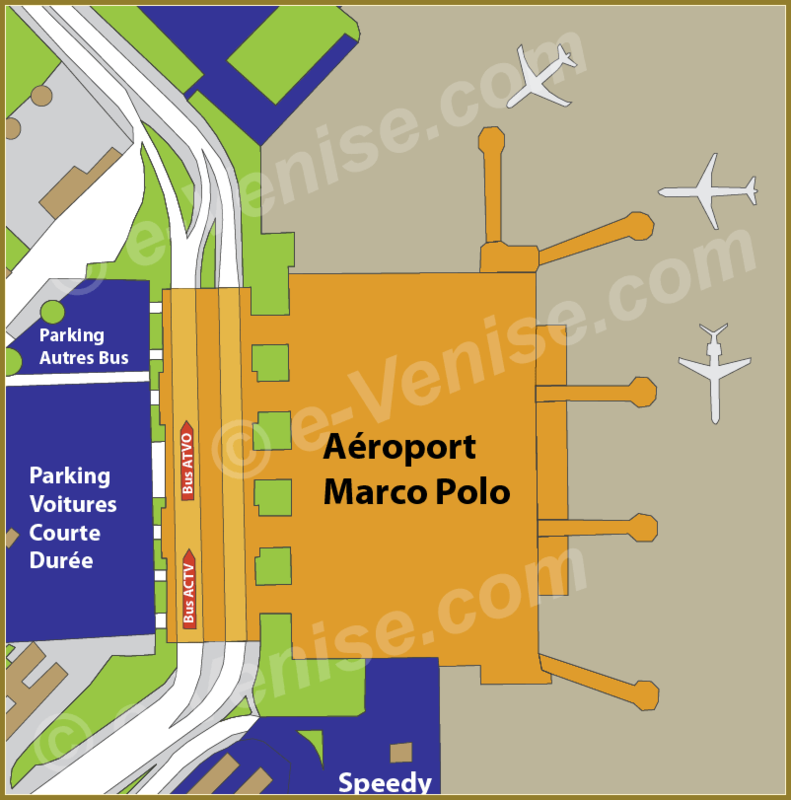 If you choose ACTV bus services, you must take the line 5 to get or come from Marco Polo Venice airport. Single fare (valid for 75 minutes) per person is of 8 € (15 € for a return ticket, each ticket is valid for 75 minutes beginning at their validation). You can also take a road taxi from Venice at Piazzale Roma to go to Marco Polo airport. It takes about 15 minutes and will cost you from 30 to 35 €.